Stormy Clouds landed the Cantering Cuisine Novice Median Stakes at Lingfield by a comfortable half-length victory giving first-season sire Sir Prancealot his first win as a stallion. The 4/9f (well backed) beat Decedent Times, the pair five-lengths clear of the third in a race where few were ever competitive. Rusumaat was a big drifter in the betting much to do with Mark Johnston's impressive start to the two-year-old campaign. Punters who took the early price of even money knew their fate as odds of 7/1 were available on the exchange (win market) just before the off. Sir Prancealot stands at County Westmead Stud for 5,000. 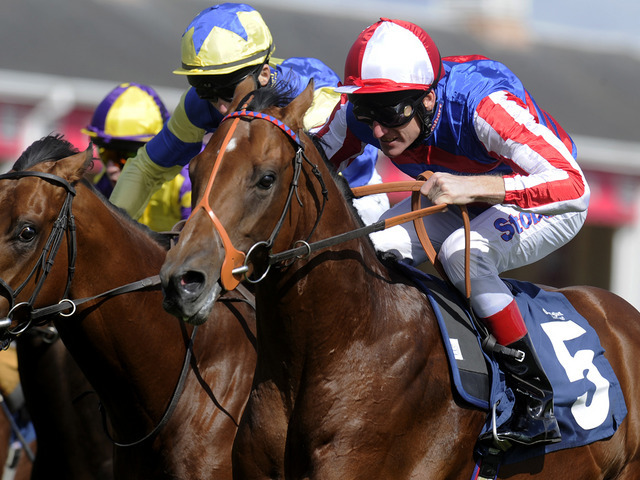 He was trained by Richard Hannon Snr, winning three times as a two-year-old in 2012. His best efforts included the Flying Childrers Group 2 [pictured] and Listed National Stakes at Sandown. He ran a cracking race in Deauville, France, when fourth in the Darley Prix Morny Group 1, losing by less than two lengths. He achieved career earnings of just over £100,000 and highest official rating of 111. Racing in the familiar silks of Andrew Tinkler, he was retired at two when victorious in the Childers at Doncaster. Stormy Clouds a bay filly out of a poor mare was purchased at the yearling sales by Peter & Ross Doyle Bloodstock for £24,000 and bred by Tally-Ho Stud. She races in the ownership of Chris Giles.